Better Homes & Gardens, 9780470638569, 288pp. If you want the freshest fruits, vegetables, and herbs around, why not grow them yourself? Home gardens are a great way to slash your grocery budget and eat great food throughout the year. Vegetable, Fruit, & Herb Gardening from Better Homes and Gardens is packed with simple step-by-step guidance on starting your own easy and affordable kitchen garden. The book includes explanatory diagrams, photographs and charts, and clear instructions that make planting, feeding, and harvesting your garden a breeze. This easy-to-follow guide covers it all-from container gardens, to large-scale garden projects, to a little herb garden on the balcony. Offers garden projects and planting plans with shopping lists for tools and plants. 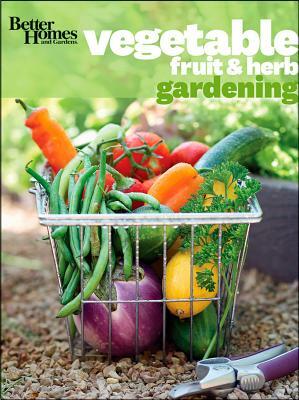 Whether you want to start a major new edible garden project or just add a little fresh produce to your pantry, Vegetable, Fruit, & Herb Gardeningis the easy-to-understand, comprehensive guide you need.